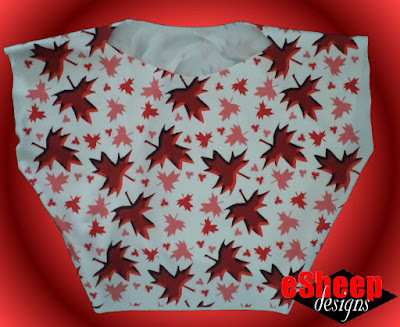 We're now just four weeks away from Canada's 150th birthday, so it's time to unveil my fourth Canada Day themed project: a fat quarter friendly quick sew crop top. It's a project that can probably be done in ten minutes if you're like those brave people who can be seen cutting away freehand in YouTube videos. 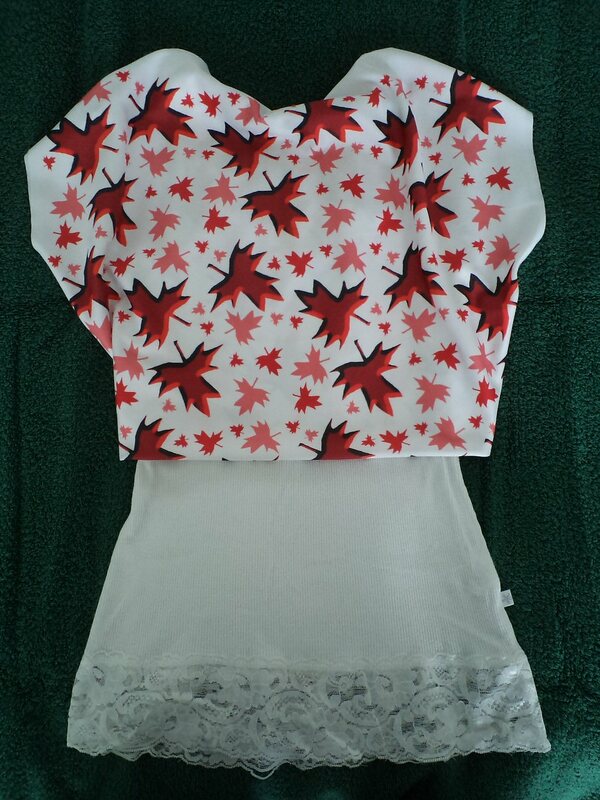 This is made out of one of my Canadiana fabrics (Maple Leaf Multi 3D on White) from Spoonflower. It's a fat quarter of performance piqué ($12.00), measuring 18" long by 28" wide. Again, due to how the fabric is printed, there is always a bit of white along all four sides that can be used in a pinch to "extend" the fabric. This "crop top over t-shirt" fooler top was the inspiration behind the project. It's technically one piece, but the black t-shirt part of it extends all the way up to attach at the shoulders, so the amount of material is the same as two pieces. Anyway, I had the idea to make the crop top part of this out of one fat quarter of Spoonflower performance piqué. It wouldn't have the exact same dimensions, but it would be close. 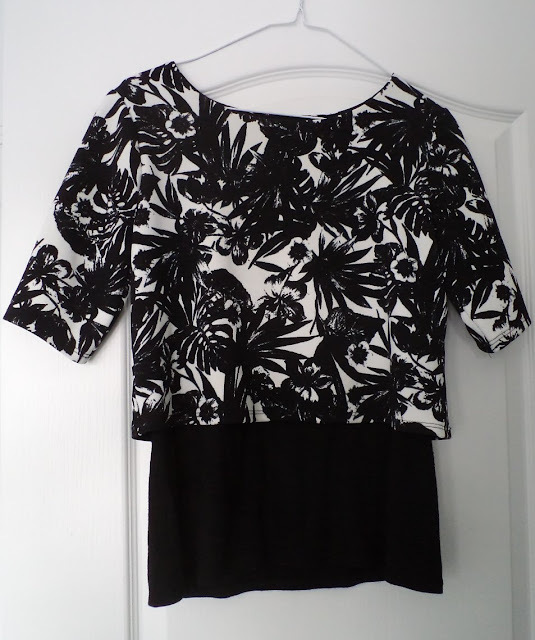 The patterned top part of this fooler — which is a North American size 2-4 — measures 18" wide across the hem, and 16.5" long from shoulder to hem. The fat quarter only allows for a length of just over 14". I did some creative folding with the fabric first to confirm that the result was achievable. As a sewing project, this can't get much simpler. All that needs to be done after squaring the fabric is to fold it in half with wrong side out, sew a seam along both edges and then cut a neckline out of the middle. The fabric doesn't fray so none of the edges need to be finished. Construction is very much like the quick sew kimono-inspired jacket that I made with P&P fabric. One word of caution before proceeding. In this particular case, I'm using the width of the fabric as the length of the finished item. If you do the same — in whatever fabric you use — choose one that does not feature a discernible directional pattern, as well as something that has a bit of two-way stretch for when you put it on. In the above picture, the folded edge measures over 18" across, due to the white space around the printed fabric. The distance from top to bottom is about 14". You can sew the side seams straight as shown above, or sew them at an angle as shown below. Whichever you choose, ensure that the total length (when measured straight along the side) is no more than 6" or 15cm. After sewing up the side seams, fold the whole thing in half. Similarly fold a piece of clothing of your choice and place it on top to use as a guide for cutting the neckline. Refer back to my second "sew up side seams" picture above. If you want the front of your crop top to have a different neckline, fold just the front section (while matching the side seams) and make an additional cut to create — in my case — a "v" neck. I realize that making this out of a single fat quarter means that it will only fit those who are on the smaller side. However, you can easily take two fat quarters and sew them together with pretty much the same results. All that's different would be a need to sew a shoulder seam. Not to mention that you would then be using the fabric along its 18" length and not its width. For other fabric choices, a fat quarter of Spoonflower's cotton spandex jersey ($13.75) comes in at 18" x 30", which gives you a little extra material to work with if sticking to the one fat quarter method. I like how it turned out. Don't you think it's a handy cover-up for a camisole or tank top that might be too skimpy on its own? This will do the job nicely on July 1st... and any other day for that matter. Simple and sassy! versatile too. Thank you. It brings a smile to my face just thinking about how useful and pretty for any figure this top is. So grateful for your lovely feedback! Many thanks for taking the time to comment.